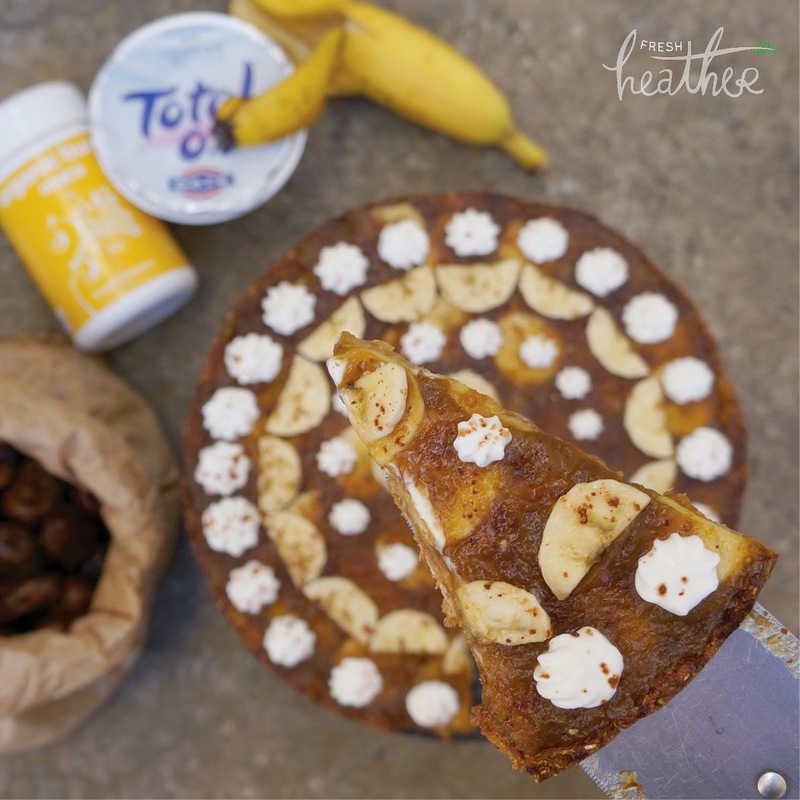 Fresh Heather : Fat Free Dessert: Banoffee Pie Recipe! Fat Free Dessert: Banoffee Pie Recipe! Fat free Banoffee Pie! For those of you who don't know, banoffee pie is pie crust filled with banana slices and caramel and topped with cream...it was always one of my favourite desserts as a child so I just had to healthily it! Oh! and I've changed my instagram name (and will soon be changing my blog name) to Fresh Heather, as you can see by the new logo! • the original butter pastry crust with a fat free oat and apple sauce version (with 1tsp of organic burst maca powder for an added health boost). • the buttery, sugary caramel filling with simple date caramel (just dates ... I managed to get 1 kilo of dates in a local supermarket for 2.25)! • the full fat whipped cream topping with 0% total greek yogurt + agave. 1. Place the oats into a food processor and pulse until you get oat flour. Add in the rest of the dry ingredients and pulse until combined. Transfer to a bowl and add the agave and apple puree. Stir until combined, adding more agave if needed. This may take a while! Once ready, roll into a ball of dough and press into a greased (with olive or coconut oil) pie tin. 2. Place in a preheated oven at 375F | 200C | GM6 for 20-30 minutes until crispy and golden. 3. For the caramel, pit 18-20 dates. Place in a bowl and cover with boiling water for 5-10 minutes until the dates have softened. Place in a food processor/ high speed blender and pulse until you have a caramelly consistency. Pour into a bowl and put to the side. 4. Thinly slice one large banana. Place slices on the pie crust. Top with the date caramel and more banana slices to decorate. 5. Mix together 100g 0% Greek Yogurt and 1tsp agave. Place in an icing piper (or just use a spoon if you don't have one) and pipe onto the pie! Just a bit more about Maca Powder if you haven't heard of it before, maca is a 'superfood' which is rich in vitamins and provides calcium and zinc. It gives you strength, improves mood, is good for your skin and can give you an energy boost! You can find more about Organic Burst Maca here. Also! To veganise this recipe, simply replace the 0% Greek Yogurt topping with homemade Cashew Cream, theres a really nice tutorial for this here.